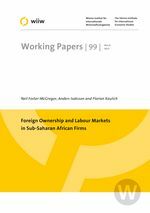 In this paper we examine whether foreign-owned firms pay higher wages and have higher levels of employment than domestically-owned firms in a cross-section of sub-Saharan African (SSA) firms using data from 19 SSA countries. We also test for the presence of wage spillovers, examining whether the wages offered by foreign-owned firms in an industry impact upon the wages paid by domestically-owned firms. Our results indicate that foreign-owned firms tend to pay higher average wages, employ more workers and generate positive human capital effects. This tends to be true for total employment and average wages for all workers as well as for blue- and white-collar workers separately. The effects of foreign ownership tend to be stronger for white-collar workers when considering wages and for blue-collar workers when considering employment. Our results also suggest that the presence of foreign-owned firms does not significantly impact upon the wages paid by domestically-owned firms however.